I try real hard not to peg musicians based on appearance, but when you meet Strand Of Oaks for the first time (aka Tim Showalter) you can’t help feel that he should maybe have a CB radio handle and/or make music that sounds like The Allman Brothers. But then he wraps you in a big bear hug and you learn that he used to be a second-grade teacher, and you realize he is a study in contrasts. His music made my jaw drop the first time he heard it live, there in the church. It was completely unexpected. I am not savvy in the use of pedals and effects in music; as far as I am concerned, it may as well be magic. From the first song “Kill Dragon” that Tim played in the big gorgeous church, there was this polyphonic, shimmering wall of sound that he created with just him and his guitar. It sounded like a thousand pipe organs, or angels, or something extraordinary. As I interpret it, this first song is about wrestling with talking to a God that seems to have vanished: “Lately he hasn’t been listening to me / I guess he’s a man and he’s meant to leave.” In the void he’s left, Tim traces the litany of things that have gone awry in his life (deaths, sickness) and says he is coming up with an interesting new prayer – to run away with Mary. A little surprised the walls of the church didn’t like, you know, crumble all around us. Tim writes thoughtful, piercing songs about sleeplessness, faith, and that which we’ve lost. This music is mesmerizing. 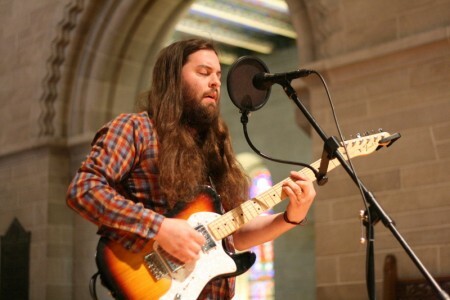 If you like this music, check out Strand of Oaks’ haunting, gorgeously wrought album Pope Killdragon, and his cover of Joe Pug’s “Hymn #101.” Tim also sang on that cover of “Hard Life” with Joe Pug in this same chapel session. ALSO: That Beck cover he did reminds me of the version that Beck himself did, also in a chapel – Union Chapel in London. Tagged with beck, covers, fuel/friends chapel sessions, strand of oaks. Study in contrasts indeed. Tim spent time with both my kids talking about music, guitars and whatever else they were interested in. Stunned an audience unfamiliar with his work with songs of depth and beauty and was generally one of the most enjoyable guys I’ve been around in along time. Been listening to the entire “Pope Killdragon” over and over. Man. That’s some great stuff. ‘Kill Dragon’ is really gorgeous. Does this file not open for anyone else? Very well written, and I too, consider his music “mesmerizing.” Thank you for this.